How do you say goodbye to your friend, protector and constant companion? I don’t believe we ever will. For now we will just say farewell, until we meet again. Our lives have been richer, happier and certainly more blessed because we shared them with Chester. He came to be with us by chance. We didn’t know what we were in for! He trained us to give him a treat every time he came inside (and he only went outside to do his business!). He trained us to go to bed at the same time every night (and he certainly let us know if we were late!). He trained us to walk him without a leash (no leashes for the king of this castle!). He trained us to never leave each other alone at night (we must all head to the bedroom at the exact same time, or he would impatiently wait on the landing!). He loved to play hide and go seek with his ears perked up, listening for any sound of movement to find his dad who was strategically hiding somewhere in the house. He would sit on the stairs and stare out the front door waiting for us to come home. He wouldn’t move until he got his “staircase lovin” when you arrived home. He didn’t get much “people” food but he LOVED eggs and popcorn. We always made extra eggs for Chester and when dad made popcorn, Chester would sit with him by the popcorn machine and wag his tail furiously in anticipation. As soon as dad had his bowl full and was seated in the recliner…one bite for dad, one bite for Chester, one bite for dad, one bite for Chester… and so it would go until the bowl was empty. There are so many memories that we will forever hold in our hearts. We miss you terribly, Ches. Enjoy your wings! We love you! Chester looked like a sweetheart! Chester looks just like my Golden Retriever. I am sorry about your loss. I know how special he was to ya'll cause they are such loyal, loving, breed of dogs. Mine is almost 8 years old now and we don't know what we'd do without her......Again, sorry for your loss. My condolences to the Markey family on your loss. 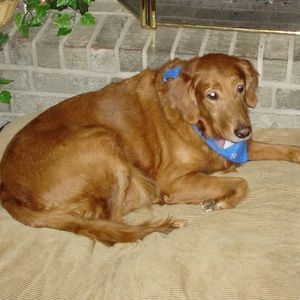 Chester was a wonderful, affectionate member of the family. He always made me feel so welcome when I was in your home. I will miss his good nature and his friendliness. Dogs come into your life and dogs go out of your life and all of them occupy a spot in your heart. But every now and then one comes along that is truly special. Our granddog, Chester, is one of those; one of those rare finds that just fits in and occupies a huge space in your heart. He will be missed by all who came in contact with him but he will really be missed by those of us that knew him best and shared that special bond that only a few humans can understand. Stanley, your cousin that lives in our home now, will never forget the dressing down you gave him when he got a little rambunctious at your home, your domain. He could learn a lot from you! GodSpeed Chester and say "hey" to Boots for us! Where do I begin? I only came into your life two years ago, but I loved you from the moment we met. You knew when I came in the door to go staright to the kitchen for a treat. Depending on how long I stayed you probably had a few more. When your family was away I cared for you, giving you many treats (our little secret) and letting you do your business! I miss you lots you were and still are a great pet. It is with a heavy heart I say goodbye for now! My precious Jake came to heaven on July 31. So hope you find your way to meet and reminisce about the extra teats and loving I gave both of you! I can't even begin to tell you how much i miss you chedder. You were the best dog in the world, no dog will ever be the same as you. I miss all the little things you do: how you hopped when you were barking at us because you were jealous we were hugging dad, i miss how i had to jump when i got to the bottom of the stairs because we know you weren't going to move, i miss the gingle of you collar, how you would sleep with your head under the bed, your obsession with squirrels, how you trained us to give you two bacons, but most of all i miss you being here. I'll always miss and love you! "You're better than the best, i'm lucky just to linger in your light"